Day in the life of a boarder. The Ready Reckoner is a document that summarises the main procedures and expectations of boarding life. It is received by all boarders at the start of the year. While Boarding at Edmund Webb, learning continues beyond normal school hours. 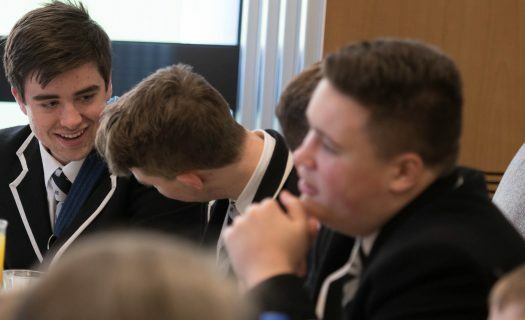 All meals at the College are provided by Alliance Catering who prepare quality meals that cater to dietary requirements and preferences, allergies and religious restrictions as well as fulfill the recommended nutritional value needed for growing teenage boys. The Boarders take part in a variety of activities after school before returning to the Boarding House at night. A number of recreational activities are available to the boarders each week. In most instances, entry to the House is between 3:00 PM – 8:00 PM the day before school starts. For Terms 1 and 3, entry is 3:00 PM – 5:00 PM for all boarders. A start-of-semester Chapel service will then take place at 5:00 PM followed by dinner. Students arriving from overseas will need to be picked up and/or stay with other family members or guardians if they arrive earlier than this time. At the end of each term, boys are expected to clean and clear their rooms. This involves stripping their bedding and taking it to the laundry. All dirty washing must be laundered prior to departure or be taken home. Boys may store a limited number of belongings in the bag store over the break at the end of Terms 1, 2 and 3. Such items MUST be labeled and put in boxes or ‘sealed’ bags. In some instances, the College may hire out rooms to external groups during holiday periods. At such times, boys will have been notified of what/how to pack their belongings. The Edmund Webb House will open in the afternoon the day before school begins each term and will close the morning after school finishes each term. The staff of Edmund Webb Boarding House will not be responsible for students during the holiday periods. Parents must inform the Head of Boarding of their sons travel arrangements prior to the end of each term. Boys must see the Master-on-Duty prior to leaving in order to have a final check of the room carried out.